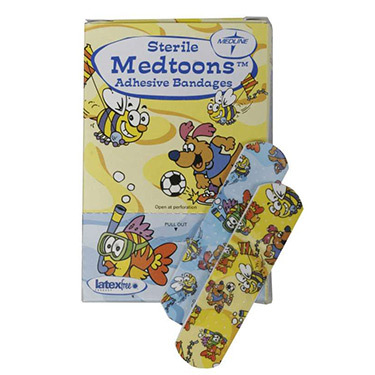 Curad Medtoons Adhesive Bandages feature a durable acrylic adhesive is skin friendly and absorbent, while the non-adherent island pad seals out dirt. These bandages are designed for children and the designs include: soccer playing dogs in red and white sneakers, smiling yellow bumble bees flying kites and colorful striped fish snorkeling with green goggles. These bandages come in a convenient dispenser box and are latex free. 50 bandages per box, 1200 bandages per case. .75" x 3".